According to a recent report, approximately 48 million Americans suffer from hearing loss. While most of them are elderlies, a large number of them are small kids as well as adults. If the problem of hearing loss is untreated then the only support that comes handy is a Hearing Aid. If you too are suffering from the untreatable hearing loss and hence want to decide the best hearing aid for you, it is best to learn about the available options and compare the topmost ones. For those who don’t know, a hearing aid is a small device placed around or in the ear. It is a medical device used to amplify sounds in order to support those who are suffering from hearing loss. A hearing aid is essential medical equipment for individuals suffering from hearing loss. Hearing loss can be either sensorineural or conductive. Sensorineural hearing loss mostly occurs because of damage caused to the small hair cells within the lining of the inner ear. These cells are responsible to convert sound waves into electrical signals, which are transferred to the brain. Such sounds are interpreted meaningfully by the brain. The most common causes of this sort of hearing loss are aging or chronic exposure to loud noise. In addition to this, certain illnesses, medications, and family history can result in this kind of hearing loss. This kind of hearing loss is not reversible, but it is possible to manage it conveniently with hearing aids that selectively amplify sounds. If a person is suffering from severe hearing loss for more than one year then this can be managed with cochlear implants that electrically stimulate auditory nerve by passing through damaged parts of the hearing system. Conductive Hearing loss is another kind of hearing loss that is less common. It usually occurs because of any physical blockage or malformation in the outer or middle ear. This sort of blockage occurs because of any disorder, buildup of fluid and infection in the middle ear, and malformations of the inner ear. If you don’t wish to use a hearing aid in this context, then you can get it rectified with corrective surgery. When the hair cells within the inner ear get dead, it is impossible to bring them back again. But with hearing aids, it is possible to drastically improve your ability to hear by making sounds easier and louder to understand. Usually, hearing aids are inbuilt with an amplifier to enhance sound, a microphone that picks up the sound, and a receiver that can send sound into the ear canal. The modern hearing aids, popularly known as digital hearing aids, come with microphones that transmit sound to a computer chip. This chip adjusts the volume as well as amplifies sound frequencies required to help enhance your hearing. Even it is possible to program the digital hearing aid to filter out wind as well as background noise and fine tune to match your specific hearing loss pattern. Moreover, there are advanced models available which can sync wirelessly with your smartphone so that you can take calls, adjust the settings of your hearing aid, and stream audio. Besides digital hearing aids, there are analog hearing aids also available. These hearing aids are not inbuilt with modern features but they are far more user-friendly and affordable. To have a better understanding of which hearing aid you must pick, you first have to know about the various types of hearing aids. mBTE or Mini-Behind-the-Ear Hearing Aid – Also known as (RITE) receiver in the ear, (RITA) receiver in the aid or (RIC) receiver in the canal, and (CRT) or canal receiver technology. The speaker of this hearing aid is inside the ear canal. It is attached to the ear through a thin wire and an ear mold or an ear canal piece. BTE or Traditional Behind-the-Ear Hearing Aid – Another kind of hearing aid is BTE. The electronic parts of this hearing aid come in a plastic case, which is worn behind the ears. The sound is transmitted to the ear through tubing which connects the case to a receiver. CIC or Completely-in-the-Canal Hearing Aid – This hearing aid is recessed into the ear canal and fits tight and deep in the ear. Since it is placed in the canal, so it has less visibility and can be easily removed with the help of a removal string. ITC or In-the-Canal Hearing Aid – This kind of hearing aid is also less visible. It has less of a plugged-up feeling as the aid is placed deep inside the canal. ITE or Traditional In-the-Ear Hearing Aid – All the electronic parts of this hearing aid are included within the case that rests in the outer ear’s bowl. Hearing aids are of great benefit to elderly and individuals with tinnitus or bilateral hearing loss, individuals with progressive or acquired hearing loss, as well as children experiencing difficulties hearing. While the most essential factor to consider when selecting between hearing aids is the complexity of the hearing loss, there are more other aspects to consider. Before you make a final decision on which hearing aid is the best for you, first have a look at the options shortlisted by us. These are the most expensive hearing aids available, which are high on quality, unmatched in durability, and can be a perfect fit for you. 1 What is a Hearing Aid? 2 What Causes Hearing Loss? UPGRADED CHIP & SAFETY IN USE - The state of the art 4-channel digital signal processing chip effectively reduces external noise coming from cars and crowds, helping you hear more clearly and comfortably when talking to others. CE certified, FDA approved. SUITABLE USE - For mild and moderate hearing loss. Loss in 20-35 decibel(dB). This is a great gift for adults or elders who want to enhance their hearing. Friends and family will appreciate. SAVE MONEY & EASY TO USE: No need to pay thousands of dollars or more just to hear better. Our hearing amplifier has 10 volume adjustment settings and 4 memory programs. Simply peel off battery seal, install the battery (making sure the positive side[+] faces upwards), connect the ear bud and start using. Adjust the volume with the volume up or down button to suit your needs. Press and hold the volume up or down button for 3 seconds to switch between 4 different memory programs. SPECIFICATION: 1 Hearing amplifier, 1 User Manual, 2 Sound tubes(left), 6 domes (3 pcs vented design & 3 pcs seal design; small, medium, and large) suitable for people with different ear canal, 1 brush, pack of 6 Zinc-Air batteries (size A13/13D), and one carrying case. WARRANTY - All items sold by Joyhear come with 3 months free return, one year warranty. Please feel free to contact us at anytime. With state of the art 4-channel digital signal processing chip, the Joyhear hearing aid is an excellent solution to your hearing loss. This hearing aid enhances sound and effectively reduces external noise coming from crowds and cars, enabling you to hear more clearly and comfortably. It is an FDA approved and CE certified product that is ideal for moderate to mild hearing loss. 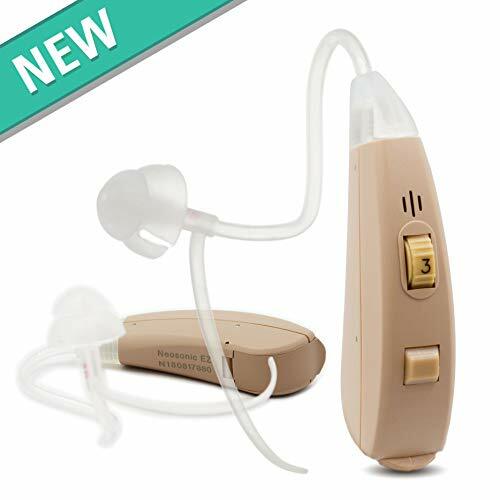 It is a perfect product for elders or adults who wish to enhance their hearing. Though this product is slightly expensive, it if a high-powered one. It comes with 4 memory programs and 10 volume adjustment settings. Even using this hearing aid is very easy. You just have to place in batteries and connect the earbud and use it. Now, one great thing about this product is that it can adjust the volume up and down button as per your specific needs. 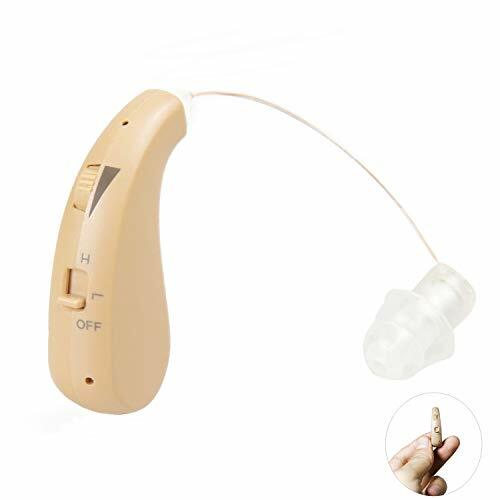 This hearing aid comes with 1 hearing amplifier, 2 sound tubes, 1 user manual, 1 brush, 6 domes to meet the needs of people with the different ear canal, and a single carrying case. In addition to this, it has 4 preset configurations for speech mode, road noise program, restaurant noise, and outdoor noise program. The device is not suitable for people with severe or profound hearing loss and tinnitus. FDA Registed Hearing Aid for All Adults : The same quality you get from an audiologist for a fraction of the price! 100% Rechargeable Hearing Aid : Save money with our rechargeable magnetic charging station that's easy and convenient! Clear Digital Sound : 4 adjustable volume controls for different environments. Easily adjust volume with just one finger. The Hearing Assist Recharge is a BTE Hearing Aid (Behind the Ear) making it discrete and easy to put on/off. The Recharge Air Conduction Hearing Aid is an exclusive product from Hearing Assist. The product is an excellent combination of convenience, affordability, and performance. This FDA registered product comes with professional grade quality as well as a magnetic charge dock for ease of use. The best part is that you never have to change the battery again. Just use ReCharge! It has HA-302 BTE four preset amplification programs, which can be adjusted to suit your unique requirement. You just have to press the program button to switch between the various programs. While Program 1 is ideal for quiet environments like home or office, Program 2 is performed for social environments with louder noise like restaurants, and more. Program 3 is TV mode while Program 4 is meant for outdoors. It is a compact and lightweight design, which is comfortable to wear. You will get this product in a kit, which has everything you need. The ear tubes, hearing aid, 3 distinct sizes of earplugs, USB charging dock, a rechargeable battery, as well as wall charging adapter. 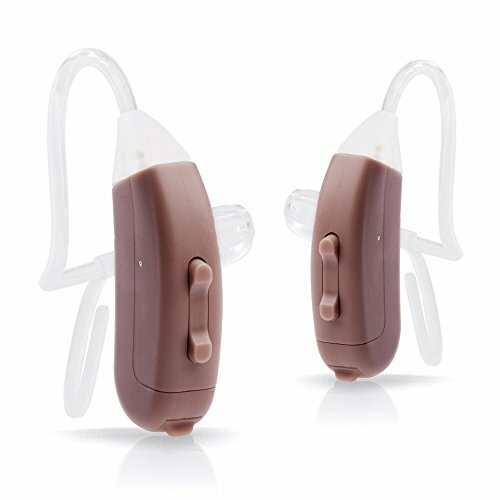 This product is from Hearing Assist, which is a leader in the direct consumer selling business. Hence, you do not have to worry about its quality. The product is meant to be used by adults only. The hearing amplifier from Otofonix Encore is one of the most powerful and advanced hearing amplifiers for adults. With personal sound amplification, it uses advanced technology, which is available in some other expensive hearing aids. The device comes with dual directional microphone hearing aid to deliver superior noise cancellation. Further, it comes with a Telecoil feature that makes it ideal for use with hearing loop systems like churches, conference centers, and theaters. It uses WDRC or Wide Dynamic Range Compression Technology that makes soft sounds highly audible. 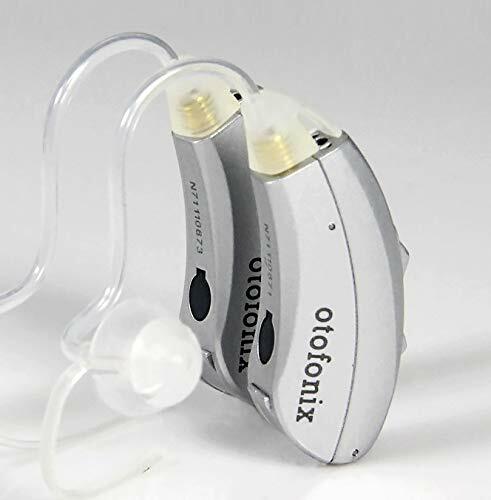 This Otofonix Encore Hearing amplifier holds 100% digital circuitry. It has 12 bands digital sound processing and 4 channels. The amplifier comes with 4 preconfigured programs to enable for an optimal listening experience in a range of environments. It has layered and adaptive noise reduction that alleviates background noise completely. With 10 digital volume levels, the device is designed to offer maximum performance and comfort. It does not just let you hear better, but it is also easy to use. While the dual directional microphone delivers superior hearing quality, it is a 2-in-1 hearing amplifier that would amplify your hearing and let you focus more clearly on the conversation in front of you. It does not support the rechargeable battery feature. If you are ready to spend some really good bucks then consider buying the revolutionary sportsear hearing aid. With select – a – fit design this product provides you with five tips to customize the fit as per your unique preference and enhance your comfort. Its unique select-a-fit shell utilizes a non-allergenic medical grade material made of rubber. As a result, you get ultra-comfortable fit as well as absolute durability while using this product. Since it can be customized to various sizes, so it is an ideal product for people of all ages as well as teenagers. In addition to this, the product comes with easy to use volume control mechanism wheel. The product comes with a microphone cover that reduces wind noise completely. So, you can easily use this product for both indoors as well as outdoors. The 42DB volume control mechanism and 4 memory push button make it a powerful device. It even features multi-program memory and maximum noise reduction that makes it very comfortable while having conversations. The advanced feedback specifications make it the best product for the users. It is one of the expensive hearing aids, but worth its value. REJOIN THE CONVERSATION with Doctor and Audiologist designed hearing solution at far lower cost than expensive prescription hearing devices. Crystal clear digital amplification brings out conversation so you easily understand everything being said and enjoy life again. Hear sounds of nature, quiet sounds. SAVE THOUSANDS OVER OTHER HEARING OPTIONS. No need to pay $5,000 or more just to hear better. Our Empower BOOST Hearing Amplifier uses an advanced 12-band processing that precisely boosts the frequencies associated with the human voice. Control programs and volume with a single switch. With four different programs, you can personalize to suit your environment. THIN AS A PENCIL, ALMOST INVISIBLE BEHIND EAR. No one will know you're wearing our high-tech hearing amplification device. Fits discreetly and compactly behind your ear. Comfortable and very effective. Available in Beige, Graphite, and Grey. 12 MONTH WARRANTY GUARANTEE ensures this will soon be your favorite no-risk purchase. This small, compact device is very durably made with superior materials and outstanding reliability. HURRY AND BUY NOW while we have both ears and all colors in stock. This makes a wonderful gift for any friend, family member, or co-worker. You will make their day with perfect enhanced hearing. 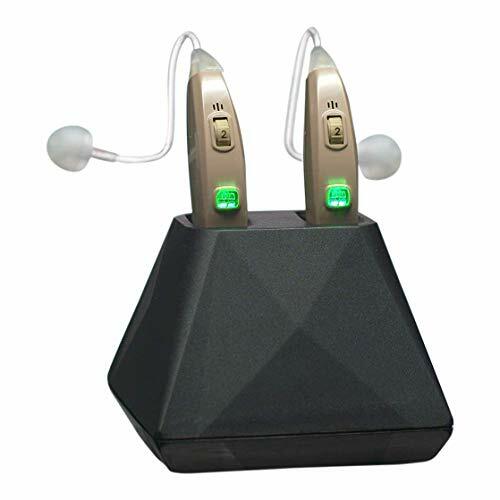 The next amazing product on our list is the Empower Hearing Amplifier with digital noise reduction. Your friends and family members will now be amazed when they will get to know that you can hear music, conversations, nature, and other sounds with excellent clarity. Missing words and unable to understand everything being said can be frustrating. But you can now put all such troubles behind with this precise, clear, and amazing digital sound. It suppresses background noises that intervene with what you hear. It comes with 12-band processing and digital amplification, which is an advanced high tech mechanism to boost the audibility of conversations. This single band is great to amplify frequencies with the same amount resulting in blocking of background noises. Moreover, this tiny device disappears behind ears and hence hardly anyone will notice what you are wearing. It is as thin as a pencil. It is a compact and powerful mini technology that gives a powerful boost to the sound required to clearly hear speech and sounds around you. It comes with 8 batteries and so you can start using it as soon as you receive it. Also, it comes with required tubing and 12-month warranty ensuring that it is the best bet involving no – risk. You can depend on this extremely high – quality product to enhance hearing, which you have been wanting for years. It involves the cost of buying new batteries. Automatically dampens harmful sounds that exceed 82 dB ensuring optimal protection against acoustic shock such as gunshots and prolonged noise. Reproduces and amplifies ambient sounds up to 20 dB in high-fidelity with the ability to adjust the volume to your liking. Standard Fit adapts to most ear canal shapes. No fitting required. Ergonomic, Half-Shell design prevents slippage. Completely Waterproof. Water-repellent electronic componets featuring P2i Aridion nanotechnology, guaranteeing superior protection against water, moisture, sweat and corrosion. Now if you are looking for a high-quality hearing aid that is not just efficient but also waterproof, then hearing aids by SHOTHUNT is one of the best choices available. It is first of a kind product that is absolutely waterproof. Hence, you can wear them while you are in the pool or while you enjoy a beach party or beach vacation. Every electronic component of this device is water-repellent and features a P2i Aridion nanotechnology. It guarantees superior protection against moisture, corrosion, sweat, and water. So, no matter what are conditions outside, you can wear these hearing aids and get absolute sound clarity. The device comes with memory foams pad ensuring a comfortable and perfect fit and adherence to the ear canals. The 3 different sizes ensure that no additional fitting is needed and all you get is a comfortable fit. It runs 100% digital processor featuring multi-channel technology eliminating harmful sounds. Hence, all you will listen to is high frequencies clean and clear sounds, which are easy to hear. It holds strong resistance to moisture, water, corrosion, and other external elements, but would not hide behind your ears. With the Neosonic BTE hearing amplifier, you no more have to compromise on the quality of sound, which you are hearing. Before you make your next trip to your audiologist, just spend some dollars and invest money in this affordable hearing aid. It is a durable and comfortable product for daily wear that offers incredible clarity during conversations under various situations. It is behind to ears model that has quite large buttons, which make it very easy to operate. This makes it an excellent device for adults, teenagers, as well as elders. The product places great boost on high-frequency sounds. The best part is that this device considers sound as its first priority, from domes to tubes, from sound conducting components to signal to process. As a result, you can hear crisp sounds. In addition to this, the device is high powered and versatile. It is powerful enough for anyone experiencing mild to severe hearing loss. It involves less than 1% distortion and low noise with 8 channels layered suppression technology. It ensures that you can listen at your best no matter what the external condition is. It comes with 12-month manufacturer warranty and is a highly durable product made with superior materials and offering outstanding reliability. It may not be the best fit if you wear glasses or being discreet is highly important for you. Environmental Microphones for Level-dependent hearing protection and situational awareness. Let the audio signals be received wirelessly from the neck loop accessory with the robust and highly durable tactical earplug. 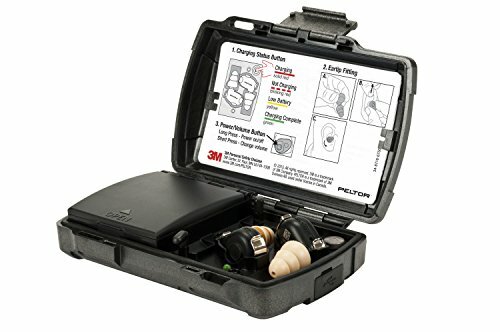 This single product offers great hearing protection, reduces noise reduction completely, and enhances your hearing to a great extent. It can help enhance situational awareness as well as communications in a noisy environment. The device is integrated with state-of-the-art technology that helps to offer hearing protection under all situations. It protects and improves situational awareness that may help increase productivity and personal safety. Also, there is a small antenna within the earpieces that enable audio signals to be received wirelessly from the neck loop accessory. The device is compatible with multiple kinds of head-borne 3M personal protective equipment or PPE like hard hats, face shields, and helmets. The lightweight and small design help enhance overall user experience and comfort. You can wirelessly connect it to cell phones or radio sources, for two-way communication. 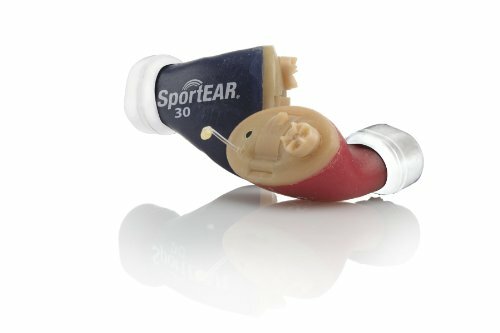 This is another advanced hearing aid introduced from Sportear. It is a revolutionary product that comes with the select-a-fit system offering you five different ways to customize the fit for enhanced comfort. The hearing aid comes with a select-a-fit shell that uses non-allergic medical grade rubberized materials offering extreme durability and ultra-comfort to the users. In addition to this, the device comes with easy to use volume control mechanism so that you can listen clearly even in too noisy environments. Also, there is a wheel microphone cover that reduces wind noise completely. The 4 memory push button ensures that you are able to listen clearly and get maximum noise reduction. It is programmed with dual digital channels and 10 bands for fine-tuning. The advanced feedback cancellation technology ensures that you get maximum protection against all internal feedbacks. 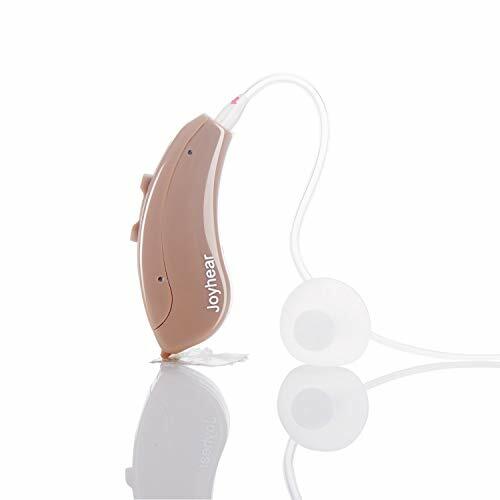 【Superior Sound】NOVORY is a Pioneer in Hearing Assist Device with More Than a Decade of Experience in Pursuit of Excellence. Latest Digital Chip Processing, RIC(Receiver in Canal)Design Greatly Reduces the Chances of Feedback and Make the Sound More Natural and Realistic. 【Digital Noise Cancelation】: NOVORY Has Powerful Noise Cancelling Function, Which can Adjust the Ambient Sound Accordingly by Detects Your Activity and Environment, and Balances the Noise Cancelling Levels Accordingly. In the other way, You can Switch 'Soft' Mode To 'Sonority' Mode('H' fit to Noisy Environment, 'L' fit to Daily Environment)by yourself to blocks disruptive background noise, makes you focus on what you want to hear. 【Scientific Design】BTE Design Reduces Occlusion Effect, and It Weight Only 4.5g and Will Not be Your Burden. What You May Not Notice is That This Unit is Designed Based On Ergonomics Theory Maximize Comfort and Stability. Great for Jogging, Biking, Hiking, Running etc, and Enjoy Your Drama, Concerts, TV etc. 3 Different Sized Earplug to Fit All Size Ear Canal, and Suitable for Children, Adults, Senior, Fits To Either Ear. 【Powerful Battery Life】: The Rechargeable Battery Provides Up to 35-40 Hours of Continuous Usage, Device Bottom Have a micro USB Port for Charging. Fully Recharges in 7 Hours(Just One Night Sleeping Time), Red Color for Charging, When Charging, the Blue Indicator Light Turns On and Flashes Continuously, and it will be Constant on after the Charging is Finished. Its Low Power Ensures Long Lasting Battery Life, You don't Have to Worry About Running Out of Battery When you Go Out All Day. 【Guarantee】: We are Confident that our PSAP Are Manufactured Under Strict Quality Standard are manufactured under strict quality standards to Give our Customers Best Experience, Every NOVORY Product Includes a One Year Warranty Guarantee& 90 Days Money Back Guarantee, We Take Care of All Quality-Related Issues with a Replacement Or Refund. Guaranteed! With advanced digital chip processing unit and RIC or Receiver in Canal design, this hearing aid highly reduces the probabilities of feedback and ensures that you receive more realistic and natural sound. This device comes with robust noise cancellation feature that can easily adjust the ambient sound by detecting the environment and activity. It balances the noise cancellation levels. The hearing aid comes with BTE design that reduces occlusion effect and hence will not be hefty on your ears. The device is based on ergonomics theory and offers maximize stability and comfort. For this reason, it is great for biking, jogging, running, hiking, and more. 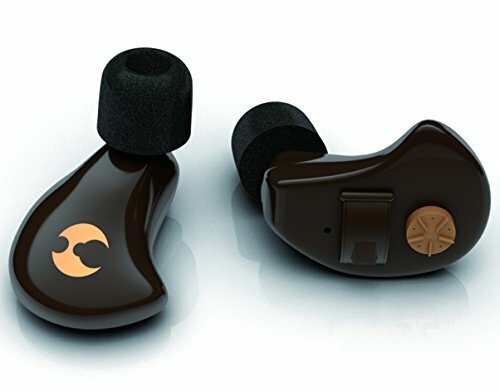 The earplug comes in 3 different sizes that ensure you get a comfortable fit. Another great thing about this device is that it comes with rechargeable battery that lasts up to 35 – 40 hours of uninterrupted usage. It gets fully charged in just 7 hours. Hence, you no more have to worry about running short of battery life. Most importantly, the hearing aid is manufactured under stringent quality standards to offer customers the best experience. It is not waterproof, but is an excellent quality product. Already in the post above, we have discussed the various styles of hearing aids available in the market. In addition to selecting a perfect style of hearing aid for yourself, there are other additional factors that you need to consider to pick the best hearing aid and improve your ability to hear. Noise Reduction – Every hearing aid offers some level of noise reduction. This level varies. Hence, you must pick a hearing aid that serves you the best. Rechargeable Batteries – Some hearing aid models have rechargeable batteries, which make them easy to maintain by eliminating the requirement to charge them on a regular basis. Wireless Connectivity – Nowadays, there are advanced hearing aid models available that come with wireless connectivity technology. Such devices come with some Bluetooth – compatible devices like music players, televisions, and cell phones. You can enhance your comfort by picking such hearing aid. But make sure it is comfortable to your ears as well. Directional Microphones – Microphones are aligned on hearing devices to offer enhanced pick up of sounds coming in front of you. Such hearing aids focus only in one direction. These microphones can enhance your ability to listen when you are in an environment with immense background noise. Variable Programming – If you don’t wish to adjust the hearing aids settings then pick a hearing aid that allows preprogrammed settings for different environments and listening needs. Synchronization – If you are picking two hearing aids then pick aids that can be programmed to function together. This way, it would be possible for you to make adjustments like program changes or volume control. As a result, you will avail simpler control. Direct Audio Input – This is an additional feature that you will get in only some hearing aid models. With this feature, it is possible to plug into audio from a computer, music device, or television via a cord. Telecoils – This feature makes it easier to hear when you are talking through a telecoil compatible mobile device. This feature eradicates all sorts of environmental sounds and can also pick up sounds from the telephone. A great advantage of telecoil is that it picks up signals from distinct public induction loop channels found in theaters or churches. As a result, you can hear the speaker and listen to music or movie better. Remote Control – There are hearing aids available with remote control. This feature lets you make adjustments without touching the hearing aid. Environmental Noise Control – It is best to pick a hearing aid with noise cancellation feature. Such a feature helps to block background noise. Some of them even offer a reduction to wind noise. When searching for a hearing aid, it is essential to explore all the options available as per your requirements. It is best to get a checkup done with your doctor as well as seek referral to a renowned audiologist. Also, you must think about the future requirements and check for product’s warranty of a product in order to get the best hearing aid. Most importantly, do follow the above-mentioned tips and hearing aids so that you can pick the best one for yourself.